Nearest Caravan and Camping Park from Killarney town centre/train and bus station. The Killarney Flesk Caravan & Camping Park is an award winning caravan and camping park and the nearest caravan and camping park from Killarney town center/train and bus station. The park is right at the start of the Kerry Way walk and cycle path into National Park and Lakes. The site is recommended by: A.A., ANWB,ICCC, MCC, Alan Rogers, ACSI, CCC, IMCC. Killarney Flesk Park Facilities Campers kitchen, laundry, Hotel, Restaurant / Take Away, Bar/Bar Food, Entertainment (High season), Bike Rental, Disabled facilities, Taxi Service, Wet weather shelter, 24 hour supervision, Supermarket and a garage 100m away . Adjacent Gleneagle Hotel: 25m Indoor Heated Swimming Pool, Childrens Splash Pool, Jacuzzi, Sauna & Steam Room, Creche & Miracle Activity Center, Gymnasium, Snooker, Squash, Tennis, 18 Hole Pitch & Putt, Par 3 Golf, Beauty Salon, O'D's over 25 Night Club. Nightly entertainment includes cabaret and singing pub with performances by Ireland's leading entertainers, Ireland's National Events Centre. From Killarney town, take the N71 south, towards Killarney National Park. 1.5km outside town centre on the left next door to Ireland's National Events Centre. Your Gateway To One Of The World`s Most Beautiful National Parks. Killarney offers endless cycling opportunities through its National Park, around its Lakes and unspoilt countryside or, for the more adventurous, through its many mountain passes and valleys. If cycling is your passion, you can hire a bike at Flesk caravan park and explore and discover the Killarney Valley at your leisure. Bring a picnic on the carrier and dine by the lakes. Killarney is an ideal location for every level of Cyclist, there are numerous on road and off road trails in the Killarney area. There are few places elsewhere on this earth that can offer the outdoor enthusiast such wonderful choice within such an intimate and hospitable location. It is said that "in Killarney, you will find a different walking route for every day in the year". At any time of year, with or without guides, walkers can choose from low level parkland walks around beautiful lakes and through some of Ireland's oldest Oakwoods, to higher level hill walks on old coach roads and bridle paths, or for the more adventurous, take on the 3000 feet + summits of the "iconic" MacGillicuddy Reeks. Long and short "linear" walks including some of the pioneering "way marked" walks like the Kerry Way and the Dingle Way can be navigated in full or in part. Killarney has a plethora of "loop walks" where walkers return to the start point without recovering their steps - some can be completed in 30 minutes while others can take 4+ hours. Hill Walking in Kerry has so much to offer, ridges, peaks, valleys and pathways. 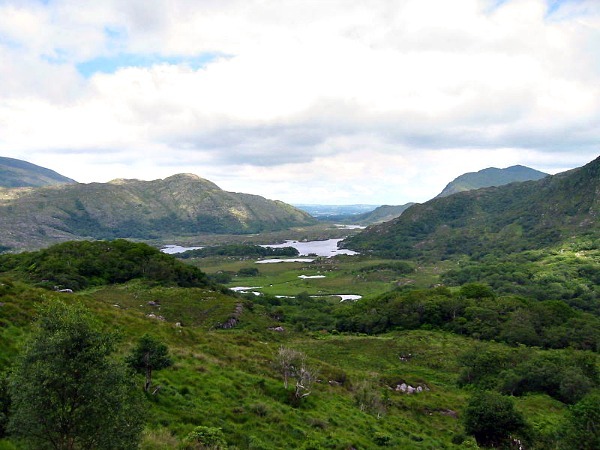 The Kerry Way runs through the County of Kerry and can be picked up in Killarney. Killarney is Ireland's premiere tourist destination and offers some of the Best Fishing in Ireland. Three main fresh water lakes and numerous smaller lakes and rivers, make it an ideal base to fish the South West. The site can arrange a tour for you and you will be collected from outside the caravan park. To see the Dingle Peninsula properly you need a full day, leaving Killarney at around 10 am and returning around 6 PM would be about right. The Dingle Peninsula or Corca Dhuibhne stretches 30 miles (48 kilometers) into the Atlantic Ocean from Ireland's south-west coast. The peninsula is dominated by the range of mountains that form its spine, running from the Slieve Mish range to Mount Brandon, Ireland's second highest peak. The Skellig Islands, Skellig Michael and Small Skellig, stand aloof in the Atlantic Ocean some 12 km southwest of Valencia Island, County Kerry. From any angle, or from any vantage point on the nearby Ring of Kerry, they are spectacular pinnacles, which have magnetized viewers throughout all history – and beyond. These Skellig islands are world-famous, each in its own right: Skellig Michael is known throughout the world of archaeology as the site of a well-preserved monastic outpost of the Early Christian period – now designated a World Heritage Site; Small Skellig is equally renowned in matters of ornithology.